Ohio cornerback Jalen Fox (21) celebrates a sack of Kent State quarterback Dustin Crum, right, during the third quarter of Saturday’s Mid-American Conference football game at Peden Stadium in Athens, Ohio. ATHENS, Ohio — You could say the Bobcats ran away with this one. 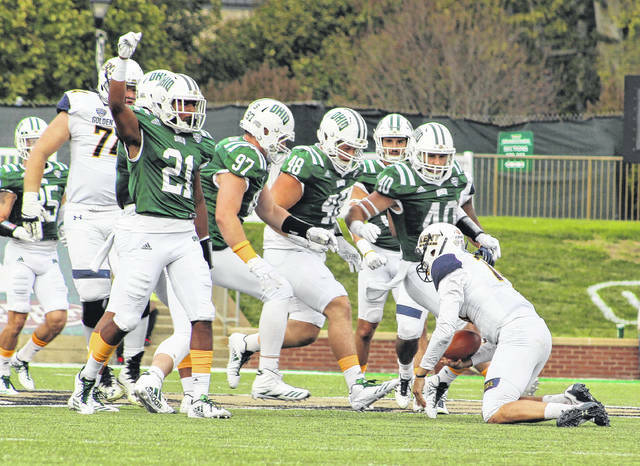 Ohio rushed for a season-high 336 yards and scored 48 unanswered points on Saturday during a 48-3 victory over visiting Kent State in a Mid-American Conference East Division football contest at Peden Stadium in Athens County. The Bobcats (6-2, 3-1 MAC) trailed 3-0 after one period of play, but the hosts rallied with a dominating performance that absolutely stymied the Golden Flashes (2-6, 1-3) the rest of the way. KSU had four first downs in the first quarter alone, but the guests managed to move the chains just three more times over the next three quarters en route to a paltry 166-yard performance in total offense. The Blue and Gold had seven punts and an interception during its eight offensive drives in the second half and did not have a first down in the second quarter. The Green and White slowly started finding their offensive rhythm in the second period as the hosts capped a seven-play, 47-yard drive with a 34-yard field goal from Louie Zervos, tying the game at three with 10:47 remaining. Kylan Nelson recovered a fumble at the KSU 31 on the guests ensuing drive, then the Bobcats needed just six plays to secure a permanent lead as Nathan Rourke scampered six yards with 8:15 left in the half for a 10-3 advantage. Zervos added a 43-yard field goal with 57 seconds remaining before halftime, allowing the hosts to take a 13-3 cushion into the locker room. Dorian Brown gave a OU a 20-3 lead following a 39-yard run at the 7:59 mark of the third, then A.J. Ouellette capped a two-play, 46-yard drive with a 37-yard scamper with 6:43 left for a 27-3 edge. Morgan Mason hauled in a 6-yard TD pass from Rourke at the 4:09 mark, then grabbed a 4-yard strike from Rourke with 1:49 remaining as Ohio increased its lead to 41-3 headed into the final period. Dylan Wears capped a five-play, 81-yard drive with a 12-yard touchdown run with 2:45 left in regulation, wrapping up the 45-point triumph. The Bobcats reached the 40-point plateau for the fifth time this season and are 5-0 in those matchups. OU has also won four straight over the Golden Flashes and are now 43-25-2 all-time. Ohio claimed a 474-166 margin in total yards of offense, which included a sizable 336-102 advantage on the ground. The Bobcats ran the ball 43 times for an average of 7.8 yards per carry, while the guests mustered only 2.8 yards per carry on 37 tries. The Bobcats produced 23 first downs and finished the game plus-1 in turnover differential. KSU had 10 of the 14 punts in the contest. Brown led the OU rushing attack with 108 yards on 13 carries, followed by Ouellette with 91 yards on 11 totes. Burroughs and Rourke also added 69 and 59 rushing yards, respectively. Rourke was 8-of-17 passing for 132 yards and two scores. Papi White led the hosts with two catches for 82 yards, while Andrew Meyer and Morgan both had two grabs apiece for 23 and 10 yards respectively. Quentin Poling led the defense with seven tackles, followed by Chad Moore with five stops and an interception. The hosts recorded four sacks and also had eight tackles for loss. Zervos also had a perfect day after converting two field goals and six extra-point attempts. Justin Rankin led the Kent State ground attack with seven carries for 47 yards, followed by George Bollas with 31 yards on 11 attempts. Bollas was also 6-of-14 passing for 61 yards. Rankin led the wideouts with three catches for nine yards. Will Matthews also had one grab for 36 yards. Juantez McRae and Jim Jones led the Flashes with seven tackles apiece. KSU recorded three sacks and nine tackles for loss. The Bobcats — who are now bowl-eligible for the ninth consecutive season under Frank Solich — return to action Tuesday, Oct. 31, when they host Miami (OH) in a MAC contest at Peden Stadium. The Halloween night game will kickoff at 8 p.m.